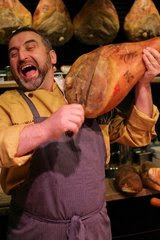 Chef Cesare Casella, Dean of Italian Studies at The Italian Culinary Academy, joined 6 other NYC chefs in upstate New York, to create a meal for 200 people out of one 500 pound Berkshire pig. Among the participating chefs were Anne Burrell, host of the Food Network's Secrets of a Restaurant Chef, and our own Dave Arnold, Director of Culinary Technology at The French Culinary Institute. Hosted by actor Aidan Quinn, the event was held at the Center for Discovery in Harris, NY, featuring a sneak preview of The Michael Ritchie Big Barn Center for Environmental Health and Education. The center, now under development, seeks to deepen residents' connections to nature and to each other. Read more about the event on Chef Cesare's blog.